Ok, I’m going to try and make this review short as I’m not sure how much time I have to write it. 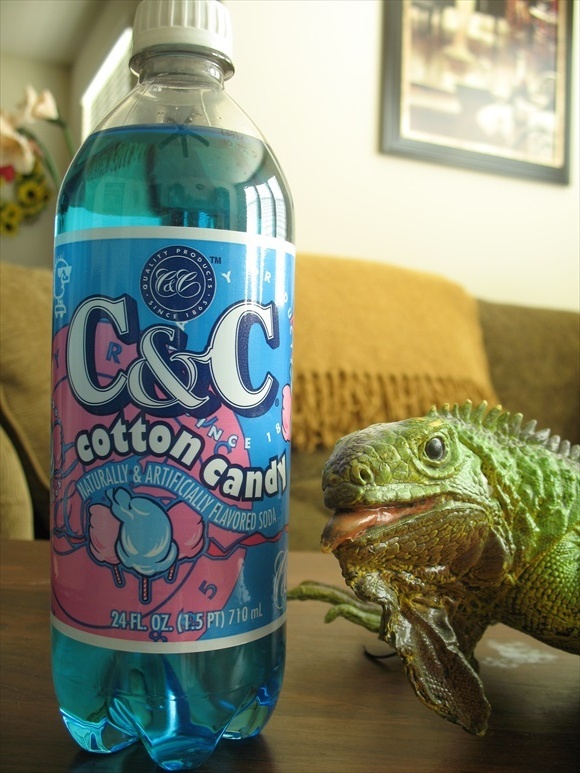 Today’s soda is C&C Cotton Candy which I think would better be named C&C’s C.C. The label looks like an Easter street fight as baby blue and pink battle for who is the most dominate. I will say that I’m happy C&C used only the true cotton candy colors. I’m not sure when purple got into the mix and tried to pass itself off as a legit flavor of sugar air, but c’mon we all know he’s a phony. It seems blue won the Easter street fight and in doing so is the actual color of the soda as well. Of all the things I don’t know about this soda I do know that it will be sweet. If you’re soda based on air sugar isn’t sweet then it might be time to go back to clown college. So gather up 27 of your closest friends and join me as I venture into the world of C&C Cotton Candy soda. Kudos to having the scent of the soda match cotton candy right on the money… minus a few scents/cents. There is a touch of the aroma that doesn’t quite add up, but it’s easily forgivable since cotton candy has like two ingredients and this has several more. This is sweet like cotton candy and tastes like cotton candy. I’d call this mission accomplished for the folks at C&C. Now I’m not a huge fan of cotton candy (a word I’m getting tired of typing) because of how sweet it is. If you’re like me then cotton candy seems like a great idea at the time, but somewhere between you engulfing the first half and just letting it dissolve against your tongue you begin to tire of the sweetness. C&C Cotton Candy is thankfully not as sweet as its carnival counterpart. With each sip my mouth is awash with cotton candy (blue) taste. As that gulp finds its way down my gullet I’m left with a pleasant aftertaste of… cotton candy. C&C has done a really good job with this soda and I’m pleased to say it doesn’t stop with the flavor. The carbonation level of C&C Cotton Candy is right where I would expect a cotton candy soda to be. It doesn’t need to be overpowering because then the harshness of the bubbles would take away some of the dessert like feel. If the fizz level was too low then it would feel like you were drinking cotton candy syrup and that doesn’t sound pleasant at all. No, the folks at C&C got the carbonation levels right on the money. Right now you might be saying “You haven’t said anything negative about this soda. Perfect score, right?” Sorry no. While it’s a tasty soda it’s just not mind blowing to me. It does taste exactly like cotton candy and that’s fun for a while, but I just don’t see myself drinking multiples of it. Let it be known that I do like this soda more than actual cotton candy, but that flavor just doesn’t make me say “wow, you gotta taste this!” With all that said I will place C&C Cotton Candy in the upper half of our grading scale. See, aren’t you happy we don’t have a cop-out middle ranking that tells you nothing. Twist used to date the tattooed lady. On her back was the battle of Waterloo, beside it the wreck of Hesperus too.